Gaudi's La Sagrada Familia is one of Barcelona's most famous landmarks. Construction has been ongoing for the last 130 years on this breathtaking church. What a fabulous cathedral and the guide was excellent. The only words to say here is Awesome and breath taking. This building is AMAZING!! So much detail and art. Pictures do not do it justice. Seeing it for yourself is the way to go. I was just in awe at how much detail and art there was at one place. Amazing church. More impressive than the Vatican. But, I don’t think that they are going to be “finished” within the next 10 years. Next stop was Barcelona and our experiences improved considerably from here on. Took the two tours, in addition to the hop on hop off bus tour to visit the old castle in Barcelona. Took the two tours, in addition to the hop on hop off bus tour to visit the old castle in Barcelona. In the future, would do the La Familia Segrada tour on our own. My favorite!!!! Absolutely stunning inside and out. We happened to hear a choir while inside. Seeing Gaudi&apos;s other city buildings just added to the excitement! We purchased tour tickets online months in advance from the Sagrada website. 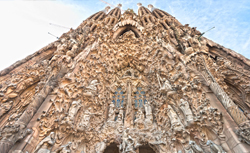 We purchased tour tickets online months in advance from the Sagrada website. They provided a fascinating tour, and they do an excellent job of managing the huge crowds at this beautiful church. Combo ticket for Hop on Hop off and appointment for entry to the Sagrada Familia. Great experience but a ton of walking to and from the drop off site. It was amazing to see this marvelous church that has been decades in the building. It was amazing to see this marvelous church that has been decades in the building. It was great seeing all of the wonderful items and to understand how the structure withstood the weight of the top towers. We spent many hours inside this fantastic, beautiful church! We spent many hours inside this fantastic, beautiful church! Loved learning and experiencing the wonder and sprituality of Gaudi&apos;s unique structure. A must see. Our tour guide was fantastic - I&apos;d recommend a guide rather than the self guided tour. We learned more than a recording could provide. I was glad I had reachered La Familia prior to tour. La Sagrada Familia was amazing. La Sagrada Familia was amazing. I think even with the guided tour you could spend hours in the church. Beautiful site. What a unique experience. The audio tour was easy to understand and helped you better understand what Gaudi was trying to accomplish when he set to design this church. You must see this beautiful church and the amazing story behind it. If I can put it in one word. Amazing to tour such an amazing monument. Amazing to tour such an amazing monument. The elevator to the top of the spire and the walk down the very narrow stairs is a must-do. The Church structure is beyond description. The Church structure is beyond description. The tour guide made the visit and was extremely Though. We learned a lot about the Architect and his work on the structure. It was an amazing experience. Third time to visit. Keeps getting better. The Basilica was awesome. Unfortunately it took us over an hour to get a taxi from the port because everyone disembarking in Barcelona was also waiting for taxis to get to the airport. The cruise ship was not helpful in the process.